Cook the bacon until just getting crisp, but not dark brown. Remove from the pan and drain on a plate with a paper towel. Drain all but 1 1/2 tablespoons of the bacon grease. Once the bacon is cool enough to handle, either crumble it or cut it into small pieces. Add shallots to bacon grease and sprinkle with salt and pepper. Saute until soft and golden, about 10 minutes. Add vinegar and stir until brown and glazed, about 3 minutes. Remove from heat and reserve. 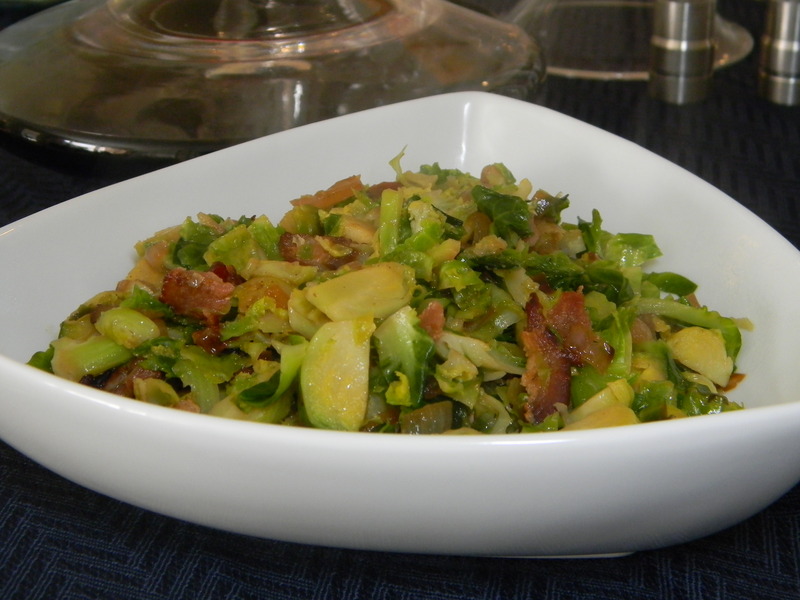 Halve brussels sprouts lenghtwise. Cut lengthwise into thin (1/8 inch) slices. Heat oil in large skillet over medium heat-high heat. Add sprouts and saute until brown at edges, about 6 minutes. Add 1 cup water and 3 tablespoons of melted butter. Saute until most of water is evaported and sprouts are tender but still bright green, 3-5 minutes. Add shallots and bacon, season with salt and pepper to taste. ENJOY! MK – I just made these tonight – they are yummy! Thank you!